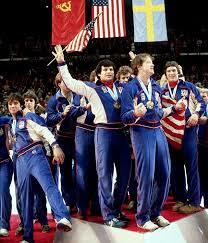 One of my favorite all time Olympic stories is the 1980 U.S. Hockey team and its run to gold. At the start of the 1980 Winter Olympics in Lake Placid, N.Y., the U.S. team was, like its gold-medal predecessor, little more than an afterthought -- even in the mind of its coach. "The Soviets had beaten us 10-3 in an exhibition a few days before the Olympics," Herb Brooks said. "They were fantastic. ... I had little hope for a medal. I would have been very happy to have achieved a fourth-place finish." The Soviets were seeded No. 1, and deservedly so. They had won five gold medals and one bronze in the previous six Olympics. The seventh-seeded U.S. team could cling to one piece of history. That one Soviet loss had been administered at Squaw Valley, Calif., in 1960, the last time the Olympics had been held in the United States -- when the Americans beat them in the semifinals and defeated Czechoslovakia to win the gold. If there was an omen for the 1980 team, good or bad, it was this: Brooks, now coach of the NHL's Pittsburgh Penguins, was the last player cut from the 1960 squad. The U.S. and USSR teams each won their first five games. On Feb. 22, George Washington's birthday, patriotism was running rampant in and outside the Olympic Field House. The Soviets unleashed 30 shots in the first two periods to the United States' 10. Only one dramatic save after another by former Boston University goaltender Jim Craig kept the United States close. When Mark Johnson scored with one second remaining in the first period to tie it at 2, Soviet coach Viktor Tikhonev replaced legendary goalie Vladislav Tretiak with Vladimir Myshkin. "We didn't even realize (Tretiak) was out of there until the middle of the next period," center Neal Broten said. "But after that first period, we knew we could win." The Soviets led 3-2 after two periods. "We told ourselves we were just down one, when we'd been down six after two periods last time we played them," team member John Harrington said. "We'd played 40 minutes, they were just one ahead, but we were younger. We wanted to take it to 'em." Johnson tied it again, this time on a power play, 8:39 into the third period. And at exactly the 10-minute mark, midway through the final period, Harrington's pass set up Mike Eruzione to become an American icon. Eruzione, the team captain from Winthrop, Mass., and a member of the International League's Toledo Blades, took Harrington's pass from the corner, skated into the slot between the faceoff circles and unleashed a shot past a Russian defenseman and through Myshkin . The explosion of cheers was deafening, and most of the 10,000 fans squeezed into the 8,500-seat arena began a chant of "USA! USA!" that never abated in the final 10 minutes. As the final 10 seconds ticked away, ABC broadcaster Al Michaels gained an immortality of sorts. "Do you believe in miracles?" he shouted, and at the final buzzer he answered, "Yes!" "You were born to be a player. You were meant to be here." As Christians we can take the same message. As Christian’s we are here for a reason, to share God’s great gift with those around us. Take the opportunity today to share that gift. Dear Lord, we pray that we would take the opportunity that we have to share Your great love with those around us. In the Name of Jesus, Amen.